A Mass of Christian Burial is scheduled for 2 p.m. Wednesday, Aug. 2, at Our Lady of Grace Catholic Church for Eliseo M. Acosta of Artesia. Acosta, 86, passed away Friday, July 28, 2017, at his home. Fr. 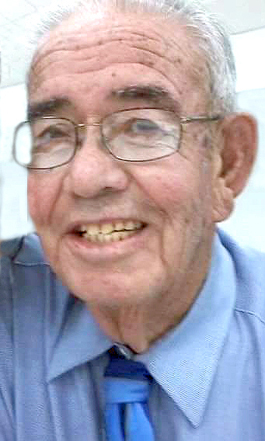 Jorge Vargas will officiate the services, with interment to follow at Twin Oaks Memorial Park. Pallbearers will be Jose Villa, Avery Hodges, Jose Gutierrez, Michael Polando, Eliseo Contreras and Robert Ramirez Jr.
Visitation will be held from 2-8 p.m. Tuesday at Terpening & Son Mortuary. A rosary will be recited at 1 p.m. Wednesday at Our Lady of Grace. Eliseo was born March 27, 1931, in Barrancos de Guadalupe, Chihuahua, Mexico, the son of Jose and Petronila (Machucha) Acosta. He was a longtime resident of Artesia. On Dec. 30, 1950, he married Manuela Balencia in Artesia. Eliseo retired as a maintenance man for the Artesia Housing Authority. He was a member of Our Lady of Grace Catholic Church, Holy Name Society, Third Order, Cursillistas, San Jose Society, and the church choir. He enjoyed cooking, gardening, and Texas Rangers baseball. Survivors include son Jerry Acosta of Lewisville, Texas; daughters Anita Acosta of Artesia, Sally Acosta Coate of Carrizozo, Rosie Paniaqua of Odessa, Texas, and Rose Marie Acosta Starnes of Dallas, Texas; sisters Olivia Fierro and Valentina Hernandez, both of Odessa; 14 grandchildren; 42 great-grandchildren; and two great-great-grandchildren. He was preceded in death by his wife, Manuela Acosta, on June 3, 2006; his parents; and four brothers.